After two losses to the Toronto Blue Jays, the Philadelphia Phillies have fallen to third in the National League East behind the Atlanta Braves, currently in first, and the Washington Nationals in second. The series against the Blue Jays began May 25 where the Phillies fell 6-5. The Blue Jays came out strong in the first inning to drive in three home runs off of a single and two doubles from three of their key batters. At the bottom of the third inning, Zach Eflin, a pitcher for the Phillies, hit a solo home run to center field to put the Phillies on the board. Another three runs from the Blue Jays in the top of the fifth put them up 6-1. The Phillies came back in the sixth inning scoring two runs off of a home run from Carlos Santana that drove in Odubel Herrera. In eighth inning, Rhys Hoskins doubled to left field allowing Cesar Hernandez to score. Then in the ninth, off of a wild pitch, Jorge Alfaro scored the last run for the Phillies but it wasn’t enough to make up for the lead that the Blue Jays had. The teams moved on to the second game of the series May 26, and this time the Phillies were able to win 2-1. A huge reason for this win was pitcher Aaron Nola who has had an amazing season so far this year. He held the Blue Jays scoreless through six innings until Blue Jay Russell Martin hit a ground ball to get to first base driving in Justin Smoak to tie the score 1-1. In the bottom of the eighth, Phillies right fielder Nick Williams hit a solo home run to win the game. The Phillies then lost their next two games: a final game against the Blue Jays May 27 and then the first game of a series against the Los Angeles Dodgers May 28. 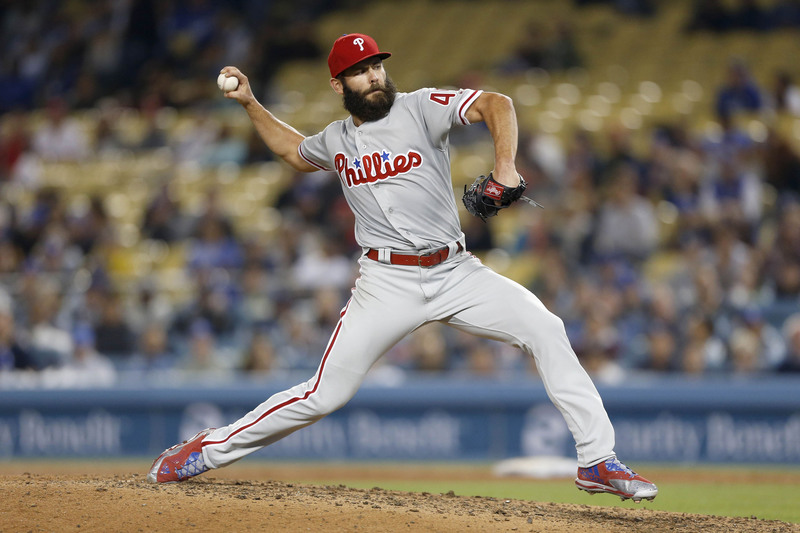 A huge win came for the Phillies May 29 as they took the second game of the series from the Dodgers 6-1. Pitcher Jake Arrieta had a great night at Dodger Stadium only allowing six hits and two walks in the first seven innings. He also struck out five Dodgers. For the month of May, Arrieta had a 0.90 ERA pitching for the Phillies. Williams hit a home run in the top of the second inning. With the bases loaded, Herrera hit a ground ball to right field that brought him to first base, pushed Maikel Franco to second and drove in two runs for Philly: Alfaro and Hernandez. Neither team scored in the next three innings. At the top of the sixth, Alfaro doubled with a line drive straight to right field bringing in another run for the Phillies from Scott Kingery. The Dodgers were down 4-0 heading into the eighth inning and only managed to score one run. At the top of the ninth, Franco singled driving in Rhys Hoskins and moving Hernandez to second base. Then Santana doubled, and Hernandez got the final run for the Phillies. After the game, Phillies manager Gabe Kapler gave a statement on the success the team has had with Arrieta as pitcher. The next game between the Phillies and Dodgers occurred May 30. They lost 8-2, and in doing so, put them two wins behind second place in the NL East. The Phillies won the game May 31 against the Dodgers.